Mule deer are small ruminants. This means that they require soft, high protein and easily digestible forage. They are not able to consume fibrous roughage. Their typical diet consists of leaves, pine and spruce needles, succulent stems, fruits, nuts, shrubs, forbs, and domestic crops and grasses. Feeding is seasonal however. From the beginning of spring to early fall, mule deer gain weight and amass fat from eating large quantities of leaves, stems and grass. Energy from the food is also used in the summer for growth and other energy expenditures. During the colder months, their fat reserves are used for energy due to the fact that there is less vegetation available. These reserves are also important to sustain the rutting activities of mature bucks(see Reproduction). Up to twenty percent of the deer's body weight could be lost in a single winter. 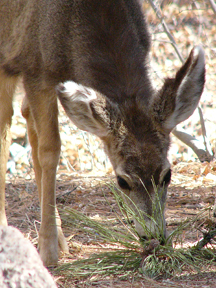 Mule deer can obtain water from several sources. These include, but are not limited to lakes, ponds, streams, rivers, and water from succulent plants.